SPOKANE, Wash. – A cloud type that spawns tall tales almost as much as Sasquatch is known to linger over peaks in the Cascade Range. Sometimes called “UFO clouds,” these saucer-shaped formations are likely to become more prominent as we enter autumn and winter. Lenticular clouds (Altocumulus lenticularis, meaning “shaped like a lentil” in Latin) mostly develop among the crests and valleys of mountainous terrain. They are associated with waves in the atmosphere that form when moist air flow is forced up, over and partway down a mountaintop. The moist air cools, causing it to condense into a disk-shaped cloud. Often a lenticular cloud resembles a spaceship hovering near a mountain’s summit. Sometimes, however, multiple clouds will pile on top of each other like a stack of pancakes. Not only do lenticulars look unique but they also behave differently than other clouds by not moving with the wind flow. By reforming over and over again in the crest of the mountain wave, they can stay in one location for several hours. Atmospheric waves generate turbulence, so pilots avoid flying near lenticular clouds. Also, because they’re a sign that rain or snow is on the way, one glance offers an instant and visually spectacular weather forecast. 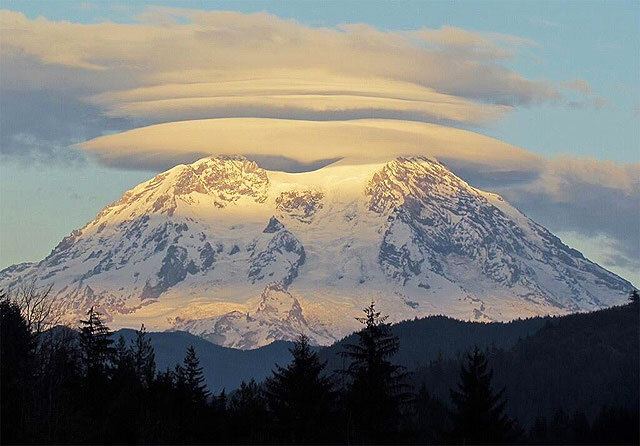 Mount Rainier, located southeast of Seattle, is a magnet for this type of cloud. Numerous news stories tell of lenticulars hovering atop the mountain. Although the clouds seem unearthly, most onlookers recognize them for what they are. Even so, a sighting by a pilot in 1947 launched a flying saucer craze, according to the book “Meteorology Today” by C. Ahrens and R. Henson. 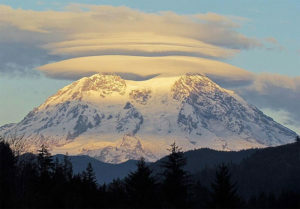 Why is Mount Rainier such a hotspot for lenticular sightings? Probably because wind and moisture coming off the Pacific Ocean are forced to rise over our region’s tallest peak. Also, since lenticular clouds form before the arrival of a storm, thick clouds aren’t yet present to obscure lenticulars from view. Thanks to studies of the atmosphere, lenticular clouds may look mysterious, but the way they’re formed is far from a mystery. Nic Loyd is a meteorologist with Washington State University’s AgWeatherNet. Linda Weiford is a WSU news writer and weather geek. Contacts: linda.weiford@wsu.edu or nicholas.loyd@wsu.edu.